The plan to visit Southern African countries was thought of way back in 1996 when I was living in Cape Town but was only realised in 2013 when I was financially and mentally prepared. Alas, as I arrived Cape Town, someone I dearly loved there, ‘Mama’ Zuleigha Isaacs who was my Capetonian mother was not in the very best of health. I cancelled the planned trip knowing that if I went ahead I would not have enjoyed it. As I returned and planned for another trip, my own mother fell ill and I took care of her until her demise in September 2016. Ironically, not realising that both the incidents that occurred had a silver lining, on this recent trip of mine as I prepared blindly for the trip in 2013 before, I could have been in a lot of difficulties logistically if I had continued the trip that year. He knows better of when is the right time to go. The current plan was also to travel to Tanzania, Kenya, Uganda, Rwanda and to sneak into DRC, South Sudan and Burundi. 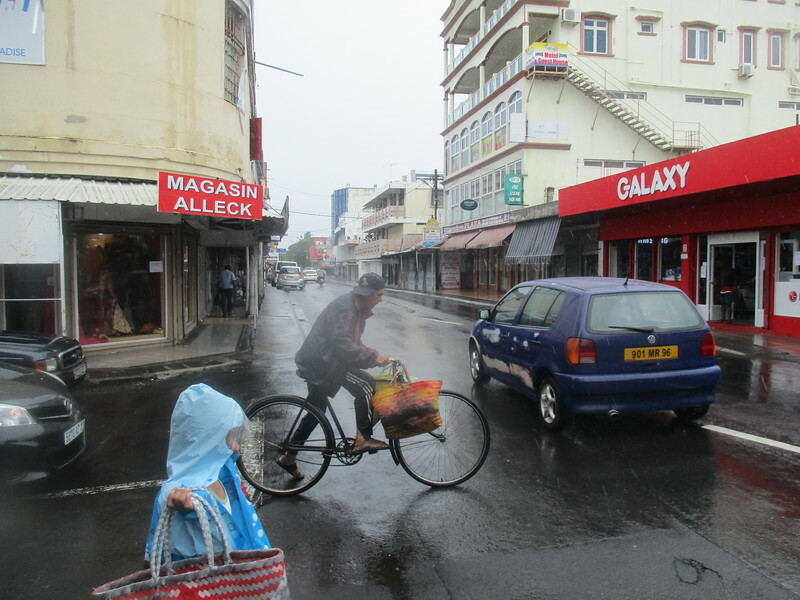 The first stop of my African Sojourn was the island of Mauritius. As Air Asia had a promotion fare of USD 70 for a one-way flight from Kuala Lumpur to Mauritius, I gladly booked it as there were a lot of direct and connecting flights to Cape Town from Mauritius daily. ‘SNAFU’ moment at Mauritius airport. It was an early morning flight and I arranged the trip to the airport with my CS (couchsurfing) buddy, Abbey, who also is a UBER driver. Checked in for the seven plus hours flight and it was a gloomy arrival at Mauritius as there were lots of low clouds around the airport when the plane landed. 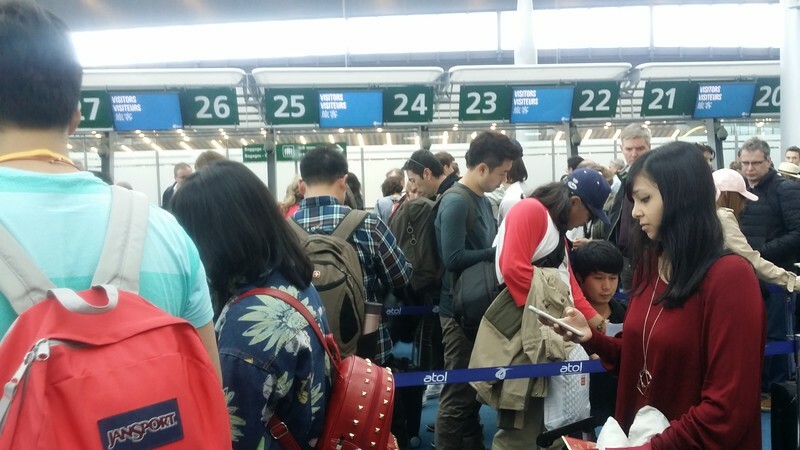 The Immigration service was at it’s worst as there were a lot of flights that arrived with a few booths opened. As I exited the baggage area I found out that I had missed the bus to the town of Mahebourg which was less then five kilometres away where would I be staying for the next four nights, resulting in an expensive taxi ride there. Low clouds and choppy seas in front of hotel room. Checked in to my hotel room which is facing the sea (lucky me!) and began organising myself for dinner as my hotel only serves breakfast. I walked to the town of Mahebourg only to find out that most of the shops were closed as it was a Sunday. The only eatery that was opened was the KFC restaurant and I had no choice but to patronise it and of course, it had Wifi …..
Cyclone brewing in front of my hotel room. After dinner, I walked slowly back to the hotel facing heavy winds which were causing coconut trees to sway at forty-five degree angles and debris that were flying hither thiter. As I reached the hotel, the owner informed me that a cyclone warning had been issued which resulted in the airport being closed and all hotel guests were advised to remain indoors. 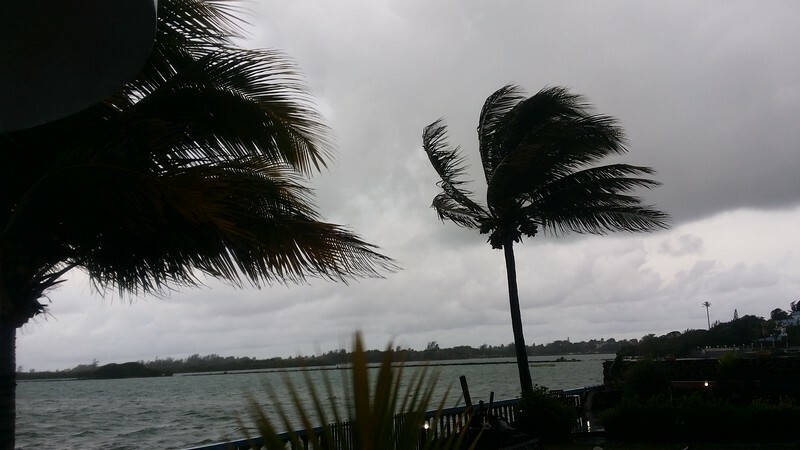 He also said cheekily that I brought the cyclone to Mauritius…hahaha…As there was nothing else to do then, I had an early night and hoped for the best of weathers the next day. In shaa Allah (God Willing).